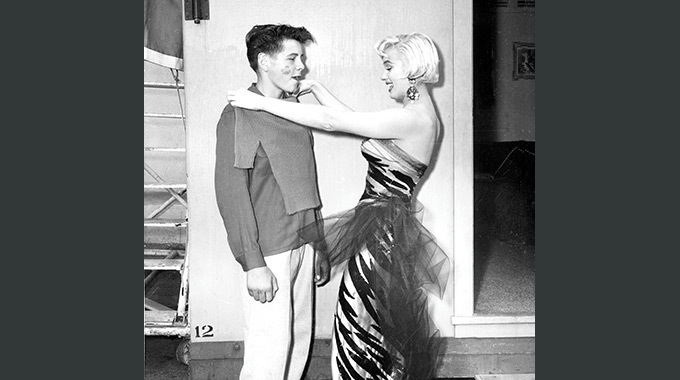 MARILYN HELPS THE BOYS – 1955; It was a big day in the life of Boys Republic student Bob Wilson when Marilyn Monroe presented him with: 1) a kiss and 2) one of the sweaters she wore in her new movie “The Seven Year Itch.” Monroe donated the sweater to the Pasadena Auxiliary’s “World’s Largest Rummage Sale” to help promote public awareness of the youth-serving agency and stimulate interest in the rummage sale. MISS KATE FOWLER – 1907; A collaborator in the founding of Boys Republic, Kate Fowler purchased and, in 1910, donated the Chino Valley property that became the Republic’s permanent home. Like her mother, Mrs. Margaret Fowler, Kate Fowler had a gift for friendship. In 1911, she gathered a group of her friends to found the Junior League of Pasadena, today known as the Pasadena Auxiliary.  The group established a tradition of service to Boys Republic that has continued down through the decades. Kate Fowler served many years on the Boys Republic Board of Trustees and later, from her home in New York, on the agency’s Advisory Board. 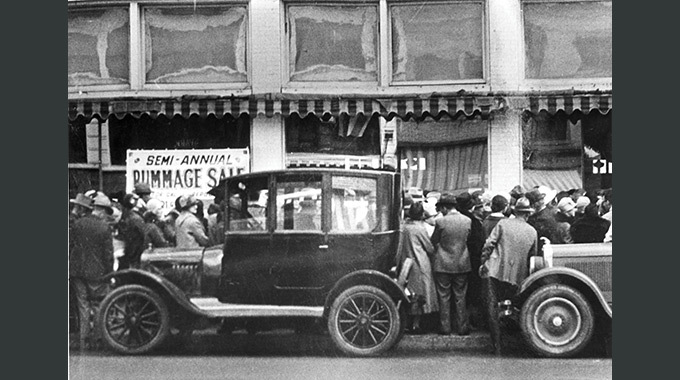 THRONGS OF SHOPPERS; The Pasadena Auxiliary sought to generate for Boys Republic a continuous flow of funding that began with the sale of fresh eggs and magazine subscriptions. But, it was the rummage sale endeavor that really captured the public’s attention. From humble beginnings in rented storefront space, the semi-annual event grew to almost epic proportions. 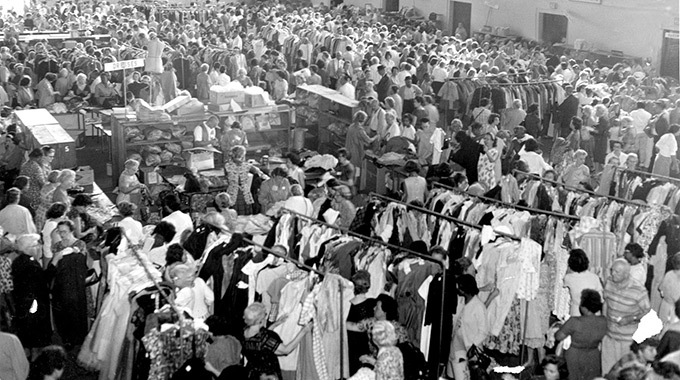 By the 1940s the sales were so well-atttended, attracting more than 10,000 bargain-hunters, that the Auxiliary relocated to the Pasadena Civic Auditorium. BARGAIN-HUNTERS; Held twice yearly, the rummage sales attracted more than 10,000 shoppers to a single event. More than 100,000 items were offered in 23 different departments. Auxiliary membership grew to over 300. Members collected the rummage items, sorted and prepared them, and conducted the sales. 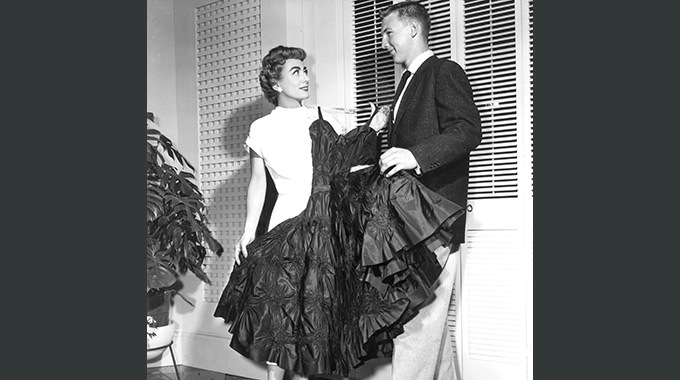 QUEEN BEE – 1956; Joan Crawford presents a gown to 16-year-old Boys Republic student Mike Wilson, to be sold to the first person in line to ask for it at the rummage sale. 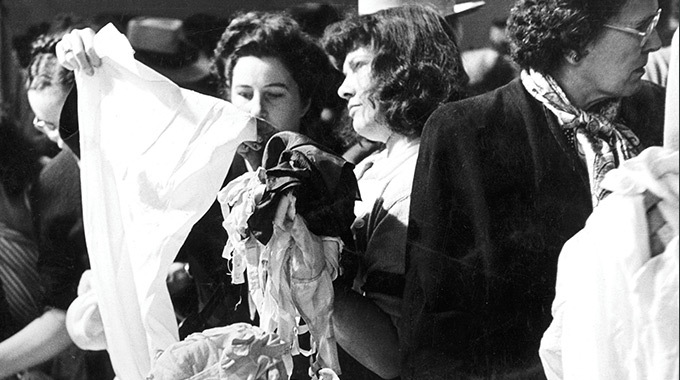 Crawford wore the gown in her movie “The Queen Bee.” Celebrities like Joan Crawford, the news media and Auxiliary members worked together to make the “World’s Largest Rummage Sale” a spectacular success. 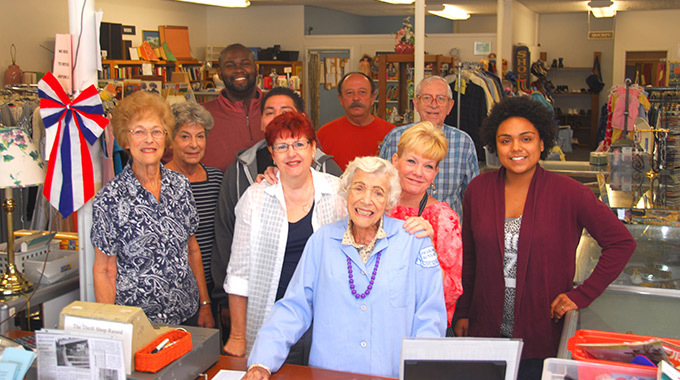 THRIFT SHOP; Since 1986, the Auxiliary has operated Boys Republic’s all-volunteer Thrift Store in Altadena. The store is a service to the students of Boys Republic and Girls Republic as well as to the local community who derive significant benefit from the bargains they find. Net proceeds of approximately $70,000 each year provide vital support for the programs of Boys Republic and Girls Republic. Boys Republic was founded in 1907, as California Junior Republic. The organization was conceived through the collaboration of a group of child-care advocates led by philanthropist Margaret B. Fowler of Pasadena. She and her associates were interested in finding a way to treat troubled teenagers without sending them to jail along with adult criminals. Mrs. Fowler provided a start-up grant of $10,000 and established the fledgling program in an old, San Fernando Valley hotel. Mrs. Fowler’s daughter, Kate, took a strong interest in her mother’s creation (please see “It Takes An Inspired Community”). In 1909, Kate Fowler donated an established dairy farm on 230 acres of land in the Chino Valley. The program relocated to its new, rural site which serves as Boys Republic’s main campus, to this day. 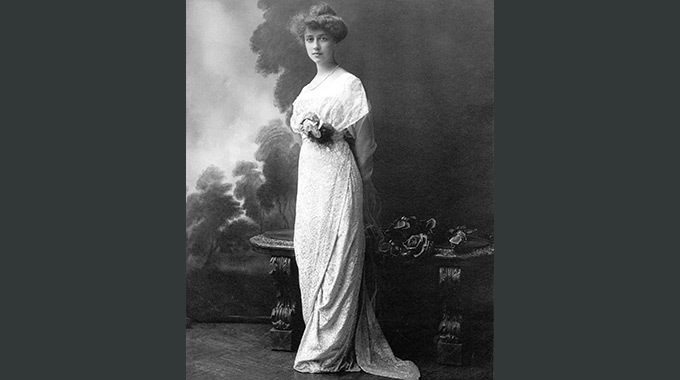 The energetic young woman continued her active support when, in 1911, along with about a dozen of her closest friends, she founded the Pasadena Auxiliary of Boys Republic. Within a short time, the group had established three traditions of service. The first was to help improve the students’ lives. The second was to help expand and improve Boys Republic facilities (please see “Pasadena Auxiliary: A Chronology of Support“). And the third was to provide a continuous flow of funding for programs and services. All three traditions continue today. The Pasadena Auxiliary supports a wide variety of student-related activities including on-campus parties, gifts of furnishings, clothing and scholarships. Physical plant improvements funded by the Auxiliary and its members over the years. include many of the structures and facilities on the main campus in Chino Hills and the Girls Republic residence in Monrovia. And fund-raising activities which began with the sale of fresh eggs and magazine subscriptions by Kate Fowler and her friends in 1911 continue today with the operation of the Boys Republic Thrift Shop in Altadena. All of the Auxiliary’s members donate their time, serving without pay or other compensation.